Vasiliy Vasilyevich Yefremov photographed on 8 December 1941. Yefremov was born in Orenburg on 1 March 1914. He joined the army in 1936 and graduated from the Orenburg Military Air College in 1938. 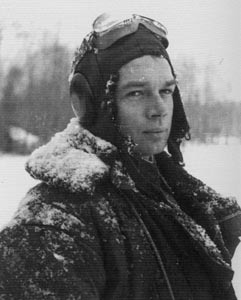 During the Soviet-Finnish Winter War 1939-40 he flew 140 combat sorties and claimed seven (or five depending on source) Finnish aircraft while flying Polikarpov I-152s. For his service during this war, he was decorated with the Order of Lenin. In June 1941, he was serving with 129 IAP, which flew over the Kalinin Front. By December 1941, he was a Kapitan, deputy leader of the 1st Eskadrilya and had flown 172 sorties. On 6 December 1941, the 129 IAP honoured and renamed to the 5 GIAP. At the time, the unit had claimed 62 enemy aircraft in the air and 20 on the ground during 1793 sorties and 1980 combat hours. 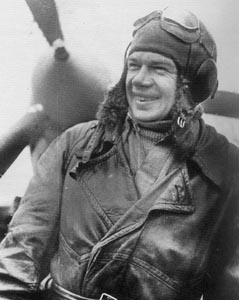 On 3 January 1942, he claimed a Do215. On 21 January, Kaptains Ivan Meshcheryakov and Yefremov of the 5 GIPA each clamed one Ju 87 in combat with Stukas from III/StG2. The German unit, however, only reported one Ju 87 damaged due to fighter combat. On 21 March, he claimed a Bf 109 while leading five LaGG-3s to engage a superior Luftwaffe formation between Gladovo-Tarutino. Seven German aircraft were claimed shot down for no losses. On 9 April 1942, he claimed an enemy aircraft while flying a LaGG-3. After this, he was given command over an eskadrilya. On 5 May 1942, he was decorated with the Gold Star of the Hero of the Soviet Union together with four other pilots from the same unit. He claimed three enemy aircraft on 30 July in the Ržev-Sycevskij area. On 2 August, three Bf 109s were bounced by eleven LaGG-3s of 5 GIAP. The regimental commander, Mayor Vasiliy Zaytsev, managed to shoot down one Bf19 during the initial attack and then Mayor Yefremov charged a second Bf 109. Severely hit by Yefremov’s bursts of fire, the crippled German fighter went down and belly-landed. The Gruppenkommandeur of III/JG 51, Hauptmann Richard Leppla, who belly-landed west of Chertolino, was seriously injured, almost losing his sight on one eye. Leppla, Rittekreuz holder with 68 victories, would spend most of the remainder of the war in staff positions and schools. Vasiliy Yefremov in front of his LaGG-3 on 10 October 1942. Around December 1942, he served for a period at VVS Headquarters as an Inspector before returning to combat. In early 1943, his unit was re-equipped with La-5s. During the summer of 1943, he took part in the operations over Kursk and during the liberation of the Donbass. During this period, he made two further claims. Yefremov ended the war with 7 (or 5) biplane victories and a total of 12 (or 19 depending on source). During the Great Patriotic War, he had flown 401 sorties and taken part in 120 combats. During the Second World War, he flew I-15(bis?) (Finland), MiG-3s, LaGG-3s, Yaks, La-5s. Included in his claims are 3 He 111s, 2 Ju 88, 2Bf 110s, one Ju 87 and one Bf 109. He remained in the Air Force after the war and was one of the first pilots in Soviet to fly jets. Up to 1948, he was a member of an expert group commanded by Yevgeniy Savitskiy. In 1953, he graduated from the Air Academy. He retired as a Polkovnik in 1971. During his career, he was also decorated with the Order of Lenin (three times), the Order of the Red Banner (five times), the Order of the Patriotic War 1st Class (twice) and the Order of the Red Star. Biplane victories: 7 (or 5 depending on source) destroyed. TOTAL: 19 (or 12 depending on source) destroyed. (a) Claimed in combat with Ju 87s from III/StG2, which got one aircraft damaged. 5 GIAP claimed two shot down. (b) Hauptmann Richard Leppla of III/JG 51 shot down and wounded. Much information kindly provided by Ondrej Repka. Additional Information kindly provided by Alexey V. Andreev.